Risso's dolphins, also known as Grampus, are one of the larger types of dolphins. Because of their size, they are usually in the deeper parts of the ocean rather than along the shores. 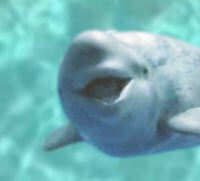 They live in temperate and tropical waters worldwide. They are easy to identify because of the crisscross scratch marks on their bodies. These markings increase over time and may be caused from teeth marks of other Risso's dolphins, squid bites and parasites. Risso's dolphins are gray with a white underside. This white patch is shaped like an anchor. As they get older they become lighter in color because of all of their scratch marks. They are blunt-headed and beakless with a tall, pointed dorsal fin and flippers. Baby Risso's (calves) are born light gray and darken as they get older. They are about 1.2-1.7 meters (4 - 5.5 feet) in length at birth. Adult Risso's are roughly anywhere from 2.6 to 3.5 meters (8.5 to 11.5 feet) in length. They weigh and average of 300 - 500 kg (660 - 1100 lbs). Risso's dolphins eat squid and fish. It is estimated that they live between 20 - 40 years. These dolphins are sometimes seen in small groups (pods) of 3 - 50 individuals. But they have also been seen in very large groups of up to 4000 dolphins. Sometimes Risso's dolphins are found swimming with other types of dolphins, especially the Bottlenose dolphin. Find out more about Risso's Dolphins!